Get a Free Buzz Lightyear 3D Papercraft. 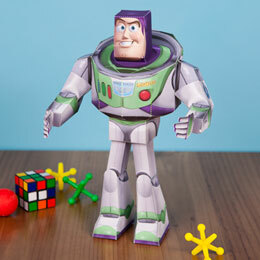 Travel to infinity and beyond with your very own 3D Buzz Lightyear papercraft! All you have to do pretty much is download the template which is located on the Disney site and follow the directions that they have listed there. This is a great way for you do make something cool and maybe even donate to a kid for the holidays. All of the free templates are designed with muted colors so that they don't waste as much printer ink as some other ones do.